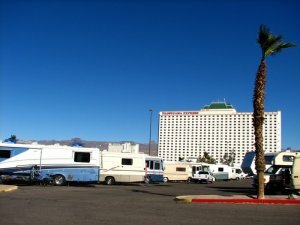 Casino Camper - Review for Tropicana Laughlin, Not free, but not bad overall. Not free, but not bad overall. We stayed here for 4 nights, in Nov. 2015, paying $7/night, but they gave us free dumping. The problem there is that the place is slanted away from the hole, so your tanks won't completely empty. And there is simply a phone number posted there, so you have to phone into the casino and then wait for someone to open it for you. There were frequent drive-bys of a security person. We didn't find anyone there to be overly friendly. I asked where to go about the rv parking at the hotel desk and the clerk was quite snippy. I also had to talk to the Player's Club, and the man there was pretty surly.